A new single-stream recycling system — heralded by the Menino administration as the latest innovation in the greening of Boston — goes into citywide service starting on July 1. The effort will allow residents to streamline their recycling at home by using one container to ready all recyclables— bottles, cans, papers and plastics — for weekly curbside pick-up. "This is the simplest thing that every resident can do to reduce their own impact on the environment and reduce trash costs," said Jim Hunt III, the city's chief of environment and energy. 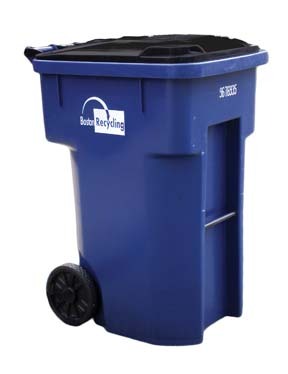 The hallmark of the beefed-up program is a 64-gallon blue cart which will slowly replace the ubiquitous and much smaller blue boxes now in use. The carts â€” which have been piloted in the South End and Chinatown already â€” will be delivered to every home in the city over the coming months. The carts will be phased into use in Jamaica Plain and Roxbury next week. Dorchester and Mattapan may have to wait a bit longer to get the carts as city planners try to deploy some 55,000 carts, along with instructions on how to use them. In the meantime, as residents await the larger, wheeled carts to arrive, officials say that residents can continue to use the smaller blue boxes or convert one of their own trash barrel into a recycling receptacle. The barrel can be identified using a green "recycle" sticker, which are available by calling the mayor's hotline, 617-635-4500. Susan Cascino, the city's recycling chief, said this week that detailed instructions on how to use the new single-stream system will be spelled out in a 15-page brochure that is being mailed to all city residents in the coming days. The big difference, Cascino, says is that residents can now load all of their items into one bin — rather than separating recyclables by paper or glass. New items that were previously restricted — including rigid plastics like toys and laundry baskets — will now be included in the system. Cascino said that residents will be alerted to the imminent arrival of a new, 64 gallon cart by postcard two weeks prior to its drop-off. The carts come with instructions on the cover to remind residents about what can and cannot be placed in them. About 1,000 new carts will be rolled out per week, Cascino estimates. One city official told the Reporter that the hope is to reach Mattapan and Dorchester by late-summer or early fall with the carts. One reason for the delay is a change in the contractor which supervises the weekly trash and recycling pick-ups in Dorchester and Mattapan. Longtime vendor Waste Management has recently been replaced by a new company, Sunrise Scavenger, which is taking over operations in this part of the city effective July 1. Rob DeRosa, the city's superintendent of sanitation, said this week that Sunrise won the contract by submitting the "qualified lowest bid" for the Dorchester-Mattapan routes, beating out Waste Management by some $70,000 annually over the five year contract. Most of Waste Management's employees are being hired by Sunrise, DeRosa said. He added that Sunrise will also be the only trash vendor under contract with the city that will house its trucks and equipment in the city limits, adding some $30-40,000 a year in excise tax revenue to the city's coffers. "The level of service will be just as good, if not better," DeRosa said. "The only thing about the collection route that might change is the timing. Not the day of trash pick up, but the time they come by. It's important that people put it out by 7 a.m. on trash day, until they get a sense of that timing after a few weeks. It may be a learning curve for the first weeks." DeRosa said that the new contractor plans to dispatch "three or four" recycling trucks on each service route — up from two under the present contract— in anticipation of a spike in recycling with the single-stream system. Hunt said that an analysis of the pilot neighborhoods showed that recycling volume went up by more than 50 percent. Hunt reads it as an indication that "Boston residents want to do their part to recycle more."